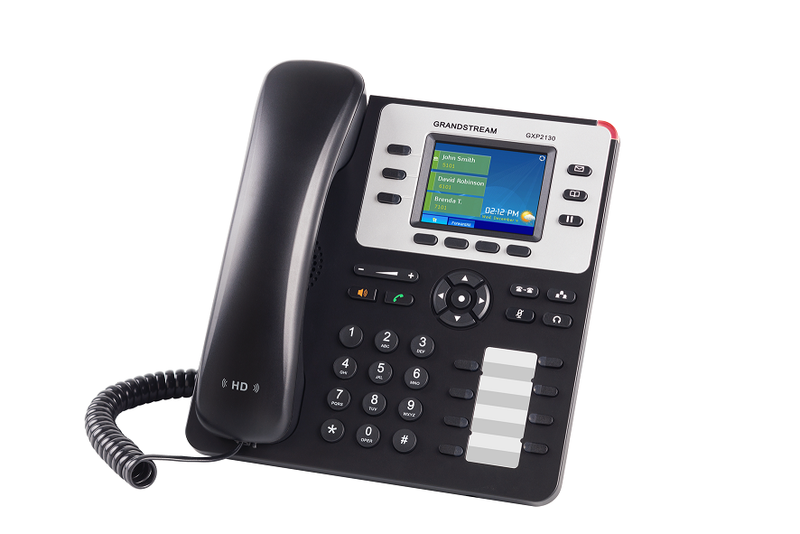 Grandstream GXP2130 - Cebod Telecom "
The Linux-based GXP2130 v2 is a standard enterprise-grade IP phone that features up to 3 lines, 4 XML programmable soft keys, 8 programmable BLF extension keys, dual Gigabit network ports, and 4-way voice conferencing. A 2.8 inch color LCD screen and HD audio allow for a crisp display and high quality calls. The GXP2130 v2 comes equipped with Blueooth, Electronic Hook Switch (EHS) support for Plantronics headsets to allow for flexibility. The phone also comes pre-loaded with weather and currency exchange apps. Ideal for SMBs, enterprises and SOHOs, the GXP2130 v2 is the perfect choice for users looking for a high quality, feature rich IP phone with advanced functionality that is simple to use.